The RSS has been gaining a foothold in North Bengal, including Naxalbari, aiding the BJP's poll prospects but significantly giving it an edge in an ideological war. 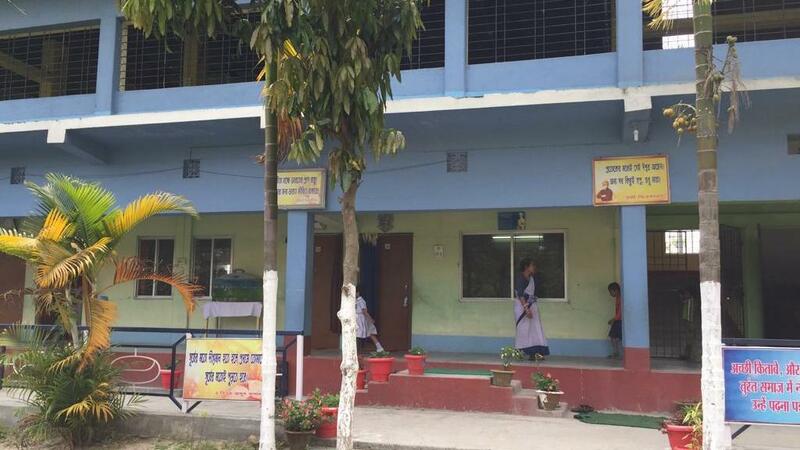 Naxalbari: On the face of it, the newly painted blue double-storey school building, on one of the dusty bylanes of Naxalbari, a small North Bengal town, is like any other in the area. On the inside, however, it encapsulates the ideological churn that is underway in this town, once synonymous with the Naxal movement. The corridor, on the school’s ground floor, is adorned with boards inscribed with quotes of Vivekananda to former President A.P.J. Abdul Kalam. Outside every classroom, portraits of the likes of Vivekananda and Madan Mohan Malviya share space with Bhagat Singh and Rabindranath Tagore. 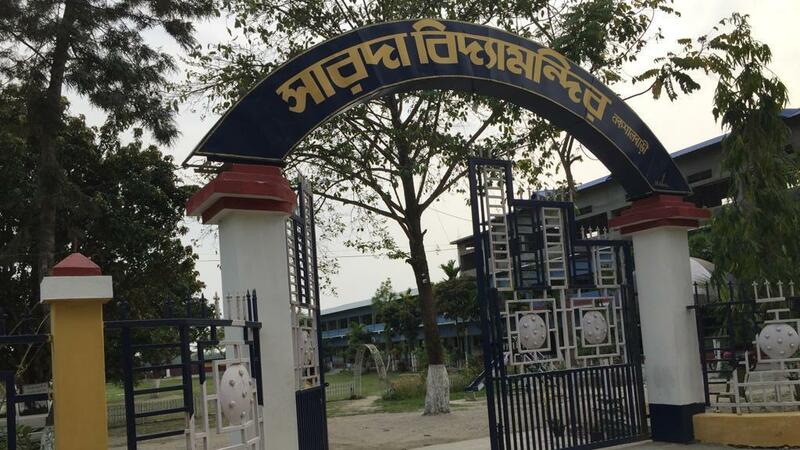 This is the Sarada Vidyamandir, a school run by the Rashtriya Swayamsevak Sangh (RSS), the ideological parent of the Bharatiya Janata Party (BJP). The Bengali medium school began in a rented house with just a handful of students in the 1990s. It has come a long way since — with classes up to Class 8, the school today has its own building and 627 students on its rolls. 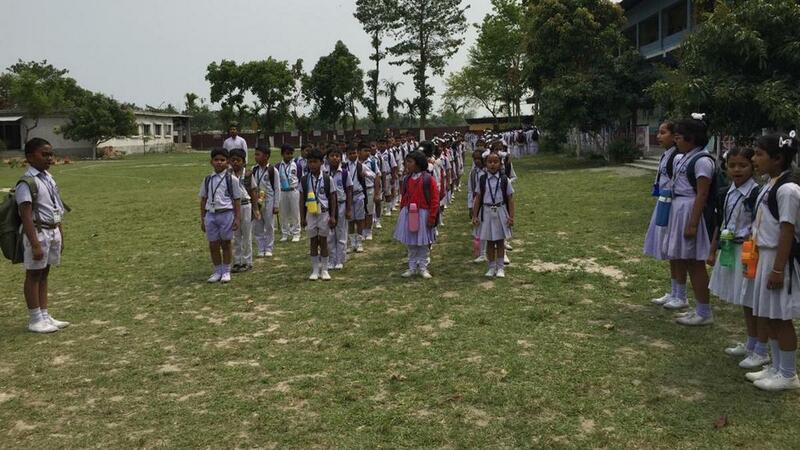 The growth of Sarada Vidyamandir, however, has not happened in isolation — it has coincided with the RSS expanding its footprint in North Bengal. And that is significant in Naxalbari, famous as the birthplace of the Naxal movement, an armed uprising by poor landless farmers to protest against the atrocities unleashed on them by landlords. Bengaijote, a small village here, was the epicentre of the violent uprising in 1967 when farmers took up arms against the landlords. Police intervened and in the firing that ensued, 11 villagers were shot dead by the police. 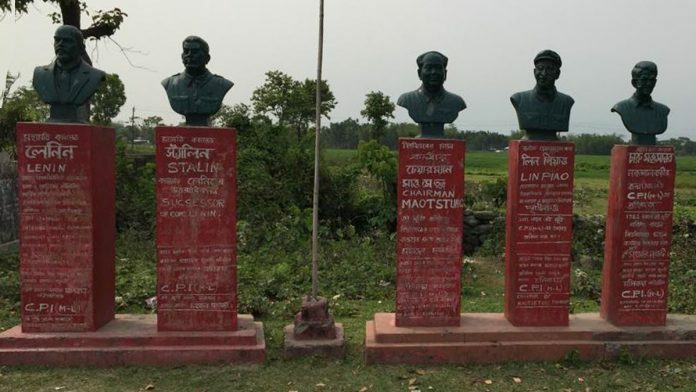 Today the only reminder of that turbulent period are the busts of some of the prominent leaders of the movement such as Charu Majumdar, which stand in a desolate corner of the town, next to a government-run primary school. 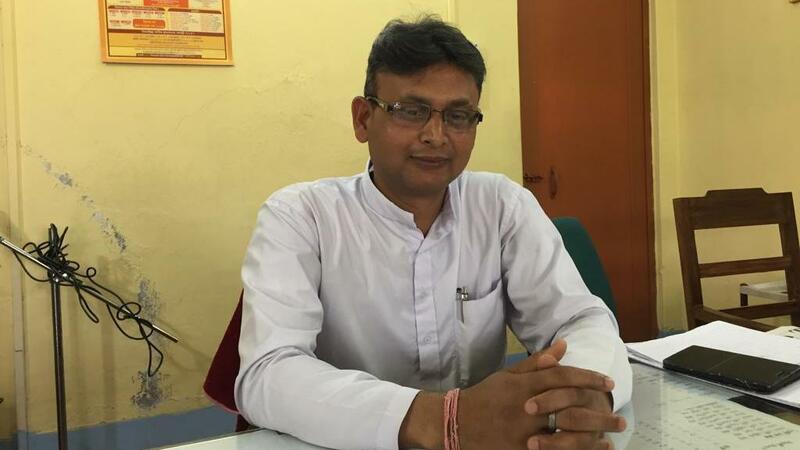 Sujit Das, principal of Sarada Vidyamandir and the RSS’ district incharge, says that when the school came up, people were sceptical about sending their children here. “Nobody knew about us back then. Parents were apprehensive about sending their children to a Bengali medium school,” he told ThePrint. The RSS has been present in North Bengal for the last two decades but it is only in the last few years, post-2014 to be precise, that it has become more active not only in Naxalbari but across North Bengal. In Alipurduars Lok Sabha constituency, for instance, the swayamsevaks (RSS workers) work actively with tribals. They have improved their network in other areas of the region too including Siliguri. The RSS-affiliated Vanvasi Kalyan Ashram runs a school in Siliguri for the children of tea garden workers, who are mostly tribals. The total number of RSS shakhas in North Bengal has grown to approximately 500, an almost three-fold increase since 2010, a senior RSS functionary of Siliguri district, who did not want to be named, told ThePrint. With the growth in the shakhas, the number of swayamsevaks have also increased to a little over 20,000 across North Bengal, mainly in pockets in Siliguri, Jalpaiguri, Cooch Behar and Alipurduars. Though Das is categorical that RSS does not indulge in any political activity, many BJP leaders in Malda, Jalpaiguri, Siliguri an Cooch Behar agree that it is the RSS’ work on the ground that made the party increase its footprint in West Bengal, especially in North Bengal. “Their presence helped us set up the organisation here and strengthen the party’s almost non-existent structure in Bengal,” a senior BJP leader, who did not want to be named, told ThePrint. “In 2009, for instance, we did not have even a single booth level worker. Today, our workers are present in 80-85 per cent of the booths in North Bengal,” the leader added. BJP leaders admit that the party has not won too many seats in the assembly and panchayat elections but point out that its vote-share has been consistently increasing. The region, for instance, falls under the Darjeeling Lok Sabha constituency, which comprises seven assembly seats — three in the hills where the Gorkha Janmukhti Morcha won with BJP’s support — and four seats in the plains. This includes the Matigara-Naxalbari assembly constituency under which Naxalbari falls. In 2016, the Congress’ Sankar Malakar won from this reserved constituency but the BJP garnered 21.31 per cent of the vote-share, a huge leap from the 4.47 per cent it managed in the 2011 assembly elections. In neighbouring Siliguri, where the CPM’s Asok Bhattacharya beat football icon Bhaichung Bhutia, who was with the Trinamool Congress then, the BJP had managed to double its vote-share — from 4 per cent in 2011 to 11.46 per cent in the 2016 assembly elections. In Phansidewa, the third of the four seats in the plains, the BJP’s vote-share increased from 3.97 per cent in 2011 to 18.15 per cent in the 2016 assembly election. The Congress’ Sunil Chandra Tirkey won this tribal seat in 2016. Even in Chopra, a Muslim dominated assembly seat here, the BJP’s vote share increased from 4 per cent in 2011 to 8.89 per cent in 2016. The TMC’s Hamidul Rahaman is the sitting MLA here. The Election Commission data also shows that overall in West Bengal, the BJP improved its vote-share from a mere 4.6 per cent in the 2011 assembly elections to 10.2 per cent in 2016. Even the Left parties concede that the RSS has been gaining ground. CPI(M) leader and Siliguri mayor Ashok Bhattacharya says the RSS has become active in the region in recent years, especially in the tea garden areas. “RSS influence has increased after 2014. The organisation has concerted its activities in tribal areas,” says Bhattacharya. The Siliguri mayor, however, says that it is wrong to say that the Left front parties have all but disappeared from Naxalbari. “Our party workers have won in the municipal and panchayat elections. Though the Left front parties did take a hit after leaders jumped the ship to BJP and Trinamool Congress but we still have a sizeable presence in North Bengal,” he says.